Gigi Keziah trained LSTMs to predict emotion using different feature modalities and compared their performance and explored 'feature importance' on select test instances. She was selected at the regional Boulder Science Fair to continue into the Intel competition! Emily Tarbush, a student at Monarch High School in Louisville, CO presented her work at the regional Boulder Science Fair on gender effects in touch-supported analgesia. 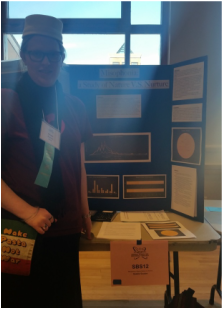 Natalie Guyton, a high school student in Nederland, CO, presented her work at the regional Boulder Science Fair on genetic and behavioral contributions to misophonia, a relatively mysterious condition where certain sounds cause pain. Julia Faulkner, a student at Monarch High School in Louisville, CO presented her work at the regional Boulder Science Fair on how gentle touch and social interactions can influence pain perception. She received the ISEF special award from the American Psychological Association for this presentation. Tess Rudd, a student at Monarch High School in Louisville, CO, presented her work at the regional Boulder Science Fair on the embodiment of emotions. 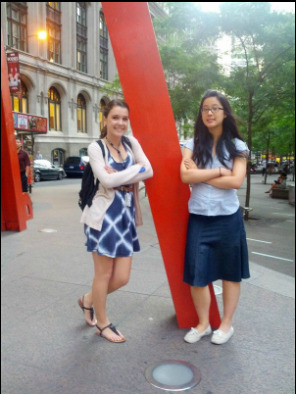 Abigail Orland (left) and May Yuan (right) are two outstanding students who I mentored on their Intel projects during their junior and senior years of high school in 2012-13 at Mount Sinai School of Medicine. Abbie is now studying psychology at Harvard (after sweeping the Intel competition with her experiment investigating the social importance of the emoticon) and May is at Wesleyan in Boston (after presenting an award winning poster on how disgust influences social decision making at the prestigious Society of Neuroscience annual meeting in 2012). Here they are at Zucotti Park (the site of Occupy Wall Street) showing their eagerness to change the world. It was a pleasure being a part of the growth of these two outstanding women!